Thiruvananthapuram: Federal agents on Wednesday arrested two priests and a nun over the death of a nun in a convent in Kerala 16 years ago. The arrests by the Central Bureau of Investigation (CBI) investigating the death of Sister Abhaya took place on Tuesday evening and yesterday morning. Rev Thomas Kottoor (centre) is brought to a court after being arrested by the Central Bureau of Investigation in Kochi on Wednesday. The three arrested are Catholic priests Thomas M. Kottoor, 61, and Jose Puthrukayil, 56, and Reverend Sister Steffi, 45. Sr Abhaya, a nun at the Pius X Convent in Kottayam was found dead in the convent's well in March 1992. The state police dismissed it as a case of suicide while investigations later pointed to the the likelihood a murder. The development comes after different teams of the CBI probed the case following sustained pressure from social activist Jomon Puthenpurackal and Sister Abhaya's parents. A key turning point was when a newspaper alleged tampering with the case's medical reports at a government chemical laboratory. Rev Puthrukayil is a former professor of a college in Kottayam where Sister Abhaya used to study, and Rev Kottoor was the Kottayam diocesan chancellor. Sister Seffi belonged to the same convent as Abhaya. The three, who were subjected to a truth serum test in Bangalore last year, were remanded in CBI custody till December 2. 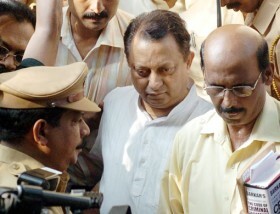 The turn of events is attributed to the detention of Sanju Mathew, whose house neighbours the convent last week by the 13th CBI team investigating the case. Mathew testified that he was a student at the time and was studying on the pervious night of March 27 when the nun's body was recovered. In the early hours of the day he had gone out to have tea when he found Reverend Kottoor's two-wheeler outside the convent. Abhaya's elderly father Thomas said he was happy that the CBI had finally made the arrests.